The typical Haflinger horse is a hardy, gentle, laid-back, friendly, people-oriented creature. 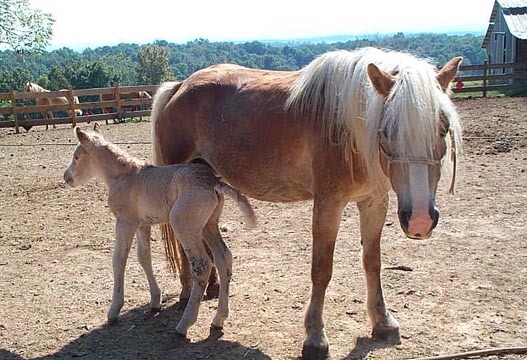 Although some people think that the Haflinger is related to a Belgian, it is in fact the result of the mating of native Austrian mountain mares with a part-Arabian stallion. The name comes from the village of Hafling, which is now a part of Italy. Haflingers were first brought to the United States in the late 1950's, and the more people who come in contact with them, the more friends they have. Haflingers are very attractive and can fulfill our fantasy images of horses. For example, in the late 1950's, before Haflingers were really known in this country, I was accidentally drawing them. My mother, on a recent visit to our farm, looked out the window at the horses and asked how I had gotten the same horses that I used to draw as a child. I realized that a Haflinger is everything you dream of in your horse-loving childhood. A Haflinger's color runs the full range of chestnut and can be from a blonde to a golden palamino to a chocolate color. The manes and tail are usually very luxurious and colored between white and flaxen.